Last summer, Rick Hayduk, the general manager of Stuyvesant Town, announced that the new owner was looking for ways to reduce the 80-acre property’s carbon footprint. This was mentioned after a decision was made not to bring back the heated sports tent that had been in the complex for two seasons. At the time, Hayduk said it wouldn’t be returning due to all the energy it took to keep the nearly three-story tent a comfortable temperature during the winter months, as well as noise complaints from neighbors. Since then, Blackstone and StuyTown Property Services have made good on their commitment to undertake some environmentally-friendly initiatives. One in October was the installation of a weather monitor to be used by the property’s landscapers to prevent the grounds from getting over-watered. In June, the owner planted 30 new trees around the complex to replace those that had died over time due to disease or pollution. I thought it would be appropriate, given the time of year, to express some gratitude and optimism during these discordant times. The Stuy Town/Peter Cooper community has been through a lot and now our country, too, is facing some tough times. As I take inventory of areas for thanks, I choose to look locally and at our great and diverse community. We have to be ever mindful that our ST/PCV community is actually a small and complex city, with unforeseen challenges. I am grateful that we have finally achieved some real stability in Blackstone as our still-newish owner and for their important choice to have key staff living among us, sharing our quality of life. I am grateful for management’s clear voice and steady hand thus far. Grateful for their choice to keep long-serving staff like Bill M. and Fred K., who keep us safe and to Kathleen K. and Tom F. who keep us warm and our homes and buildings functional. For Rick H. and the new members of his team who are making real efforts to care for our community. 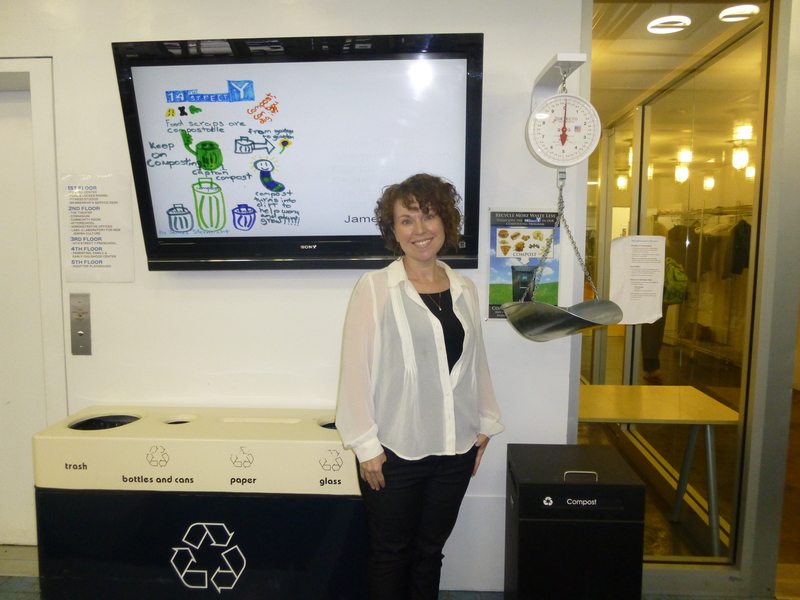 At the 14th Street Y, administrators have been hoping to get members to learn the joy of composting, a form of recycling of food scraps that reduces the amount of waste that ends up in landfills. And so far, the new compost drop-off program — essentially a bin at the East 14th Street center’s lobby alongside a scale — has actually been a surprise success with its members, residents of Stuyvesant Town and the East Village, who’ve been showing more than just a fleeting interest in the waste-reducing activity. This may be because, according to Camille Diamond, the Y’s communications director, who runs the program, the goal of the project was actually to demonstrate that composting is actually pretty simple. However, New Yorkers generally only get the opportunity to do it at greenmarkets, and even then, the food that can be composted is usually limited to produce and other items available at the markets. At the Y, other food waste can also be composted and then it’s all taken to a plant in Delaware that processes and then sells the compost to farmers. Adults have too, considering that a composting workshop held at the end of June was a big hit and a couple of local restaurants, Northern Spy Food Co. and Hotel Tortuga, have offered gift certificates for participants who are automatically entered into monthly giveaways. The composting program, which was the idea of Y member Laura Rosenshine, has been in place since March. Diamond said the Y had been looking at ways to make the building more green. When food waste is emptied into the bin in the lobby, it goes into bio-bags, which are bags made of corn. Initially, the bags were picked up and taken away twice a week, but the pickups have become a little more frequent recently as more members have begun to participate. On average, around 300 pounds of composted materials have been coming into and leaving the Y each week and 180 member families have signed up for the program. To learn more, email camille_diamond@14streety.org.